Alfresco is the latest (about 3 years on the Boston market) of the high-end professional grills in the market. It has the high quality, high output burners you would expect. There are also a few proprietary features. You may like this grill better than more established brands like DCS or Lynx. We will look at the company, the product and compare it to other high-end grills. Dale Seiden started Alfresco grill in 2000, after leaving Lynx. He also has experience in the commercial industry. Seiden specifically wanted to create a better product and a better luxury outdoor kitchen experience year around. 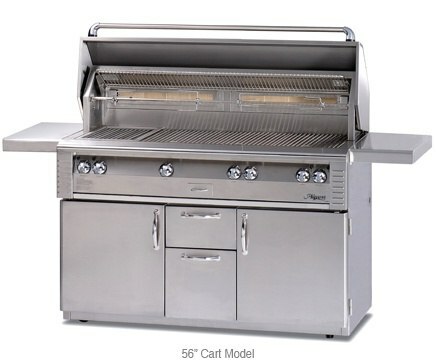 Alfresco grills are available in 30”, 36”, 42”, and 56”. They can be built-in or freestanding with the cart. All Alfresco grills feature the specially designed titanium burners, which can withstand (weather resistant steel) any harsh climate. Alfresco also utilizes commercially quality stainless steel. 27.5K BTU stainless steel burners. Watch this overview of the grill here. Alfresco has a sear burner rated at 1500 degrees versus Lynx and DCS at 1000. Alfresco burners are set at 27,500 on each burner and more powerful than Lynx and DCS at 25,000. High heat burners allow food to cook faster thus sealing juices and provide flavors. Alfresco Grills have chromium burners, which can withstand any condition. DCS grills have standard stainless steel burners, which are more susceptible to weather. I also like the Lynx brass burners as well. The Alfresco rotisserie can handle 125 lbs of meat. DCS can only hold 50 lbs with Lynx at only hold 40 lbs. The rod can also be stored conveniently underneath the lip of the grills. Both DCS and Lynx rotisseries will hang outside the grill, but Alfresco is self-contained for a better space savings. Alfresco has a dedicated 5,000 BTU smoker to infuse any type of wood chips, or herbs into the meats. DCS is similar but only at 3,000 BTU. Lynx does not have a dedicated element to effectively infuse additional flavors. Alfresco and Lynx both use the ceramic briquettes to evenly distribute heat. Alfresco diamond shaped ceramic briquettes has 5 way heating for even heat distribution. The unique pyramid shape also catches and vaporizes food drippings, which creates a smoky, full flavorful taste. Lynx is very similar but their square briquettes can require more cleaning. DCS has ceramic radiant rods placed above the burners. The rods can heat up to 1000 degrees versus 800 for Lynx and Alfresco. DCS can really sear anywhere whereas both Lynx and Alfresco have dedicated high heat elements to sear. Structurally all three brands use the best steel at 14-gauge (304 grade stainless). 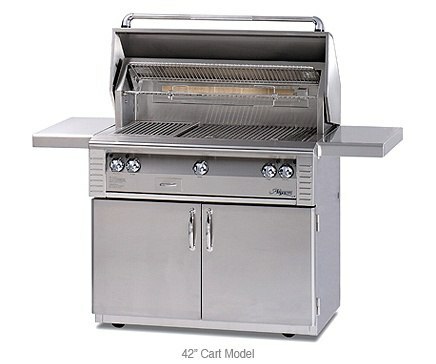 All grills use sturdy heli-arc welded components. The warranty of Alfresco is two years versus one for both Lynx and DCS. 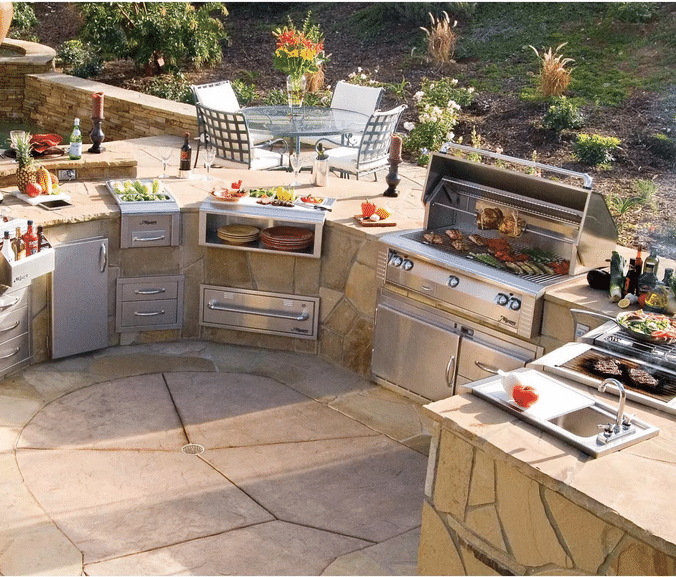 Alfresco has been the forerunner of designing and manufacturing outdoor kitchens. 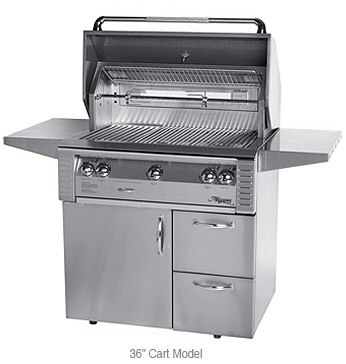 They have a full slate of outdoor products from grills, refrigerators to pizza ovens. You can have them professionally design your outside space with just a layout of the space. Location of house in relationship to kitchen. Location of pool (if one) in relationship to kitchen. Outdoor room (if one) in relationship to kitchen. Wind direction in relationship to kitchen. View in relationship to kitchen. I like Alfresco grills. It is made to last (as it should be). Their warranty, output and sear capability are really best in class. They should be a consideration for a really decent professional grill. Get The Yale BBQ Grill Buying Guide with BTU outputs and features of every brand like Lynx, DCS, Kalamazoo, Weber, Napoleon and more. Well over 95,000 people have read a Yale Guide.